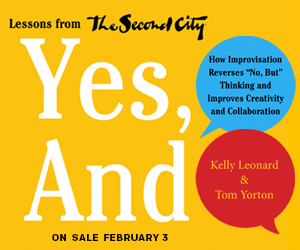 Tom Yorton, CEO of Second City Works and Kelly Leonard, Executive Vice President of The Second City, Inc., will be in conversation with Frank Sennett, Crain’s Chicago Business, as part of a Keynote speech Friday, April 17th at 3:00pm during the Lake FX Summit. This panel will discuss the tenets of improvisation and how improv can be used in professional settings. More information can be found here.